Omotola Sotade . A graduate of the University of Ibadan, with a Bachelor of Science degree in Zoology. 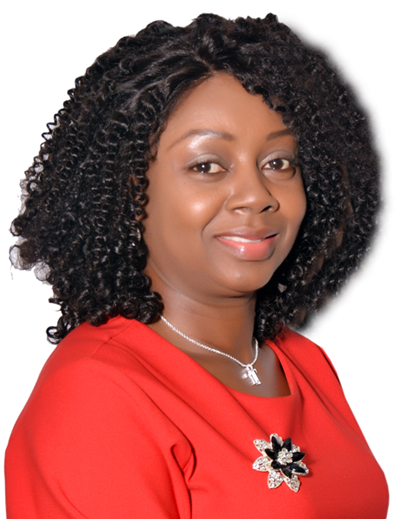 She is an Associate of the Certified Pension Institute of Nigeria (ACIP), an Associate of the Chartered Insurance Institute of Nigeria (ACIIN) and also an Associate of the Risk Managers Society of Nigeria (RIMSON). She is a seasoned Insurance practitioner with about twenty-one (21) years experience in the insurance industry. She started her career in insurance with Leadway Assurance Company Limited where she worked for about five (5) years during which she gained experience in Bonds, Engineering, Marine (Hull and Cargo) underwriting and Marine (Hull and Cargo) claims administration. She had a distinguished career there and contributed immensely towards improving work procedures and productivity. Omotola joined Zenith General Insurance Company Limited as an Assistant Manager and is currently the Head of Marketing, overseeing marketing and business development. She has attended trainings both locally and internationally spanning areas of Marine Cargo & Hull Underwriting (including other classes of insurance) and Claims, Customer Satisfaction, Relationship Management, Marketing, Leadership, Micro Insurance, Life Insurance, Anti Money Laundering. She has also been involved in all the Oil & Gas Energy insurance programs handle by the company in the past.